Are you ready for ham flavored soda? It’s hheeeeerre! (And no, I did not say ham WITH soda, and i also did not say coke-flavored ham or ham cooked with coke, i said HAM SODA! ) 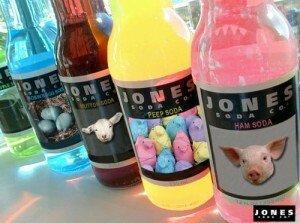 The Seattle-based Jones Soda Co. is offering a Christmas pack of flavored sodas, and among these is ham soda. And yes, it is kosher! (Thank goodness, right?) This interesting flavor is meant to compliment Christmas because it goes right in with “Christmas Ham” (it’s just a carbonated version!). The carbonated ham-flavored beverage will be caffeine free, and you might just see it in the supermarket right next to coke, so don’t pick it up accidentally! ha ha ha. You can pick up the ham-flavored soda as part of the Jones Soda 2007 Holiday Christmas pack. Anise Flavored Liqueur is a type of liqueur which is flavored with anise. Pretty simple, eh? (A liqueur is an alcoholic beverage that has a sweet-tasting flavor…liqueurs are often used to add that extra flavor to an alcoholic drink). You’ll find the taste sweet, and some people would describe the flavor as tasting licorice-like. The sweet-flavored beverage should be mixed in a cocktail for best tasting results! Different parts of the country call anise-flavored liqueur different things. There are varieties known as anisette, ouzo, and sambuca. Absinthe is one variety made from a narcotic herb (so not widely sold)- wormwood, which a plant whose leaves include absinthine and anabsinthine, and is sometimes used for indegestion. A drier-flavored variety of anise liqueur is anis.